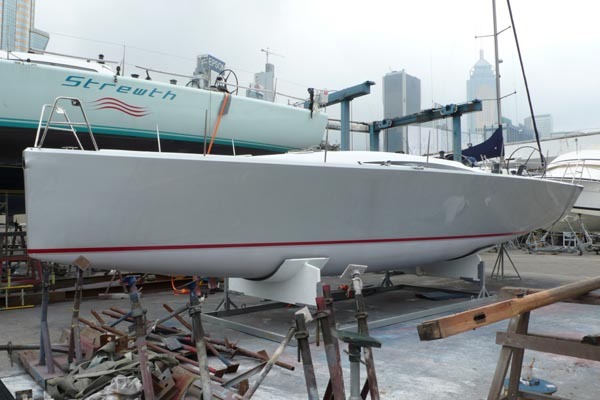 Stylish custom IRC Cruiser/Racer for Hong Kong. 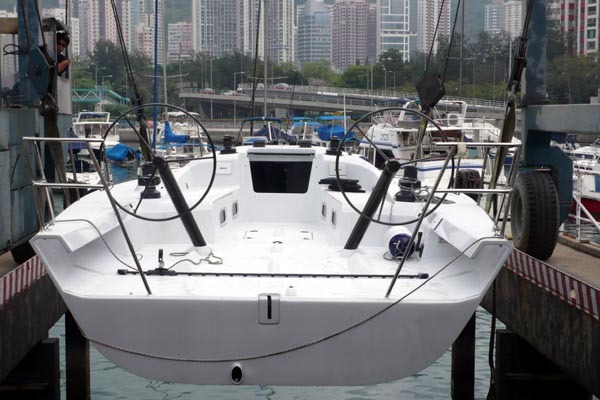 Experienced partners Andrew Taylor and Joachim Isler are no strangers to custom boat projects, and when they decided to get serious about IRC performance in Hong Kong they wanted something special. 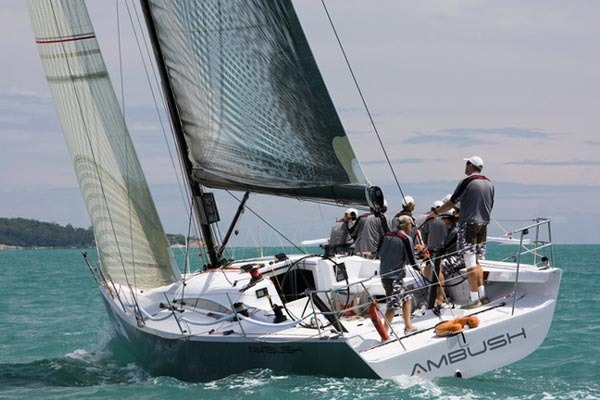 Their new IRC 41′ Ambush has been built by Mark Evans at McConaghy’s chinese operation in Zhuhai, and reflects the brief they originally laid out: it has to be an IRC performer, it has to be aimed at the specific conditions of Hong Kong with an eye towards the far-flung regional events like Kings Cup, and it has to genuinely serve their families as a dual purpose design for cruising in the beautiful South China Sea. With clients like these willing to take a few risks to get an exciting package we proposed a design which combines interesting visual cues with an evolutionary step forwards under the water. 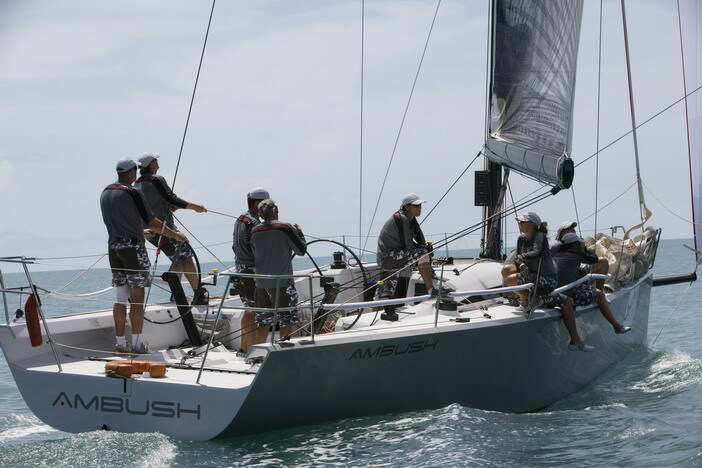 The design effort started with a CFD program with America’s Cup consultants Cape CFD. 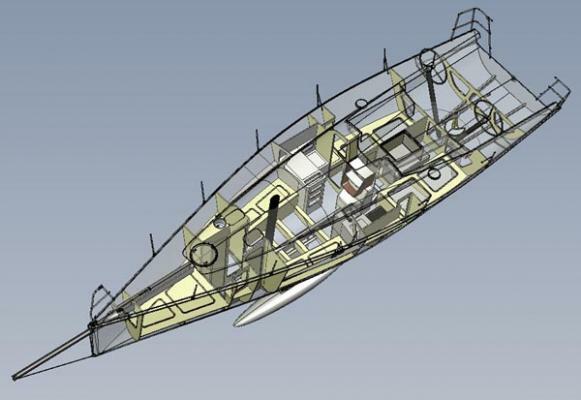 With the growing maturity of the software and their experience organising and analysing CFD results inspiring confidence in the data, we looked at developing the successful design thread we have been pursuing at this size/weight category under IRC. 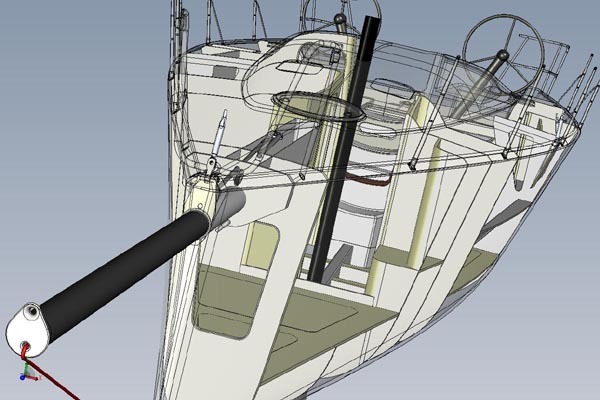 One area for example to be validated was the shaping of the aft hull sections, some of the results are visible in the increased transom width which can be maintained without sacrificing light airs performance. 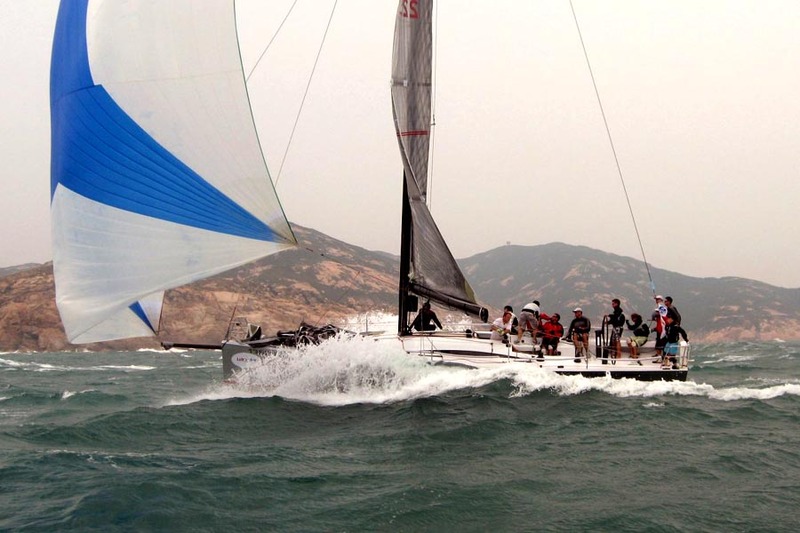 The two swept-spreader carbon rig is a natural in IRC, while the the medium/light bias of Asian conditions and the desire to sail the boat with less crew the flush retracting bowsprit option was a perfect fit. Above the waterline some attention to aesthetic detailing offers an interesting yet functional deck layout. The integrated coachroof and coamings, the faceted sheer and cockpit edges, and the centreline retracting sprit combine to produce a sleek and uncluttered look with nice details such as the liferaft locker in the cockpit floor and the trademark McConaghy steering system. 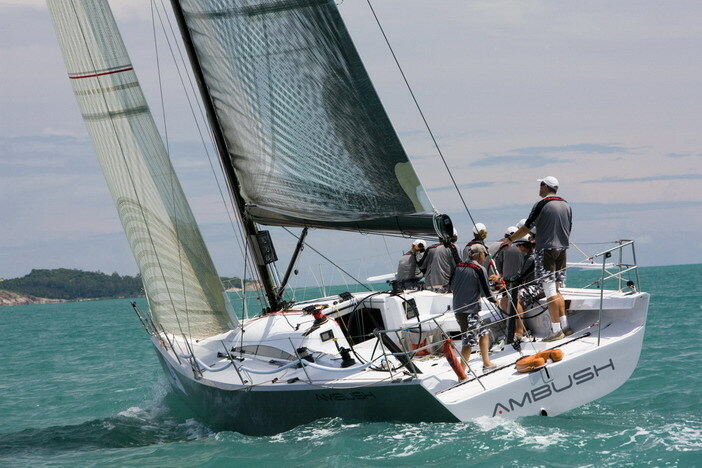 The interior features two enclosed double cabins aft, a double V-berth forward of the enclosed head and hanging lockers, and full Galley and Nav facilities. 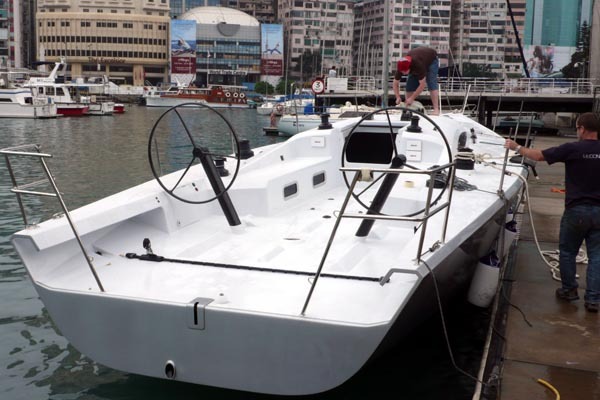 Beautifully built of epoxy/e-glass over foam core the owners are very happy with the quality: “this is about the best finished boat I have seen for a long time”. 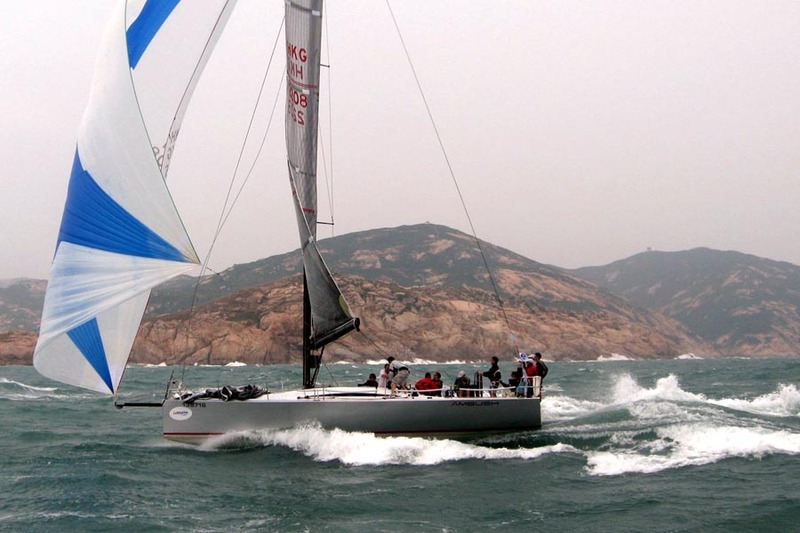 She has proved impressive across the wide range of conditions experienced in Hong Kong, with significant winning margins in the light air/flat water racing of the BMW Autumn Regatta held in the harbour, the heavy airs and extremely steep seas of the China Coast Regatta course south of Hong Kong Island, and the long Typhoon Series covering all wind speeds and angles.